Soil moisture is an important hydrological parameter, which is essential for a variety of applications, thereby extending to numerous disciplines. Currently, there are three methods of estimating soil moisture: ground-based (in-situ) measurements; remote sensing based methods and land surface models. In recent years, the cosmic ray probe (CRP), which is an in-situ technique, has been implemented in several countries across the globe. The CRP provides area-averaged soil moisture at an intermediate scale and thus bridges the gap between in-situ point measurements and global satellite-based soil moisture estimates. The aim of this study was to test the suitability of the CRP to provide spatial estimates of soil moisture. 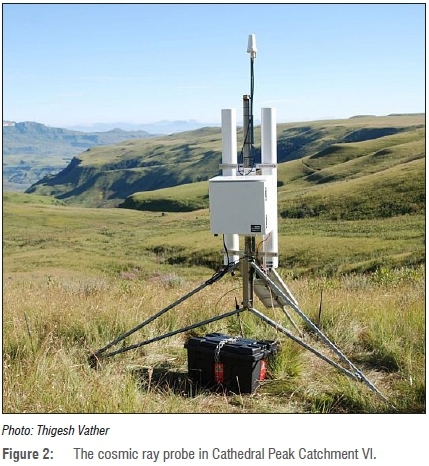 The CRP was set up and calibrated in Cathedral Peak Catchment VI. An in-situ soil moisture network consisting of time-domain reflectometry and Echo probes was created in Catchment VI, and was used to validate the CRP soil moisture estimates. Once calibrated, the CRP was found to provide spatial estimates of soil moisture, which correlated well with the in-situ soil moisture network data set and yielded an R2 value of 0.845. The use of the CRP for soil moisture monitoring provided reliable, accurate and continuous soil moisture estimates over the catchment area. The wealth of current and potential applications makes the CRP very appealing for scientists and engineers in various fields. •The cosmic ray probe provides spatial estimates of surface soil moisture at an intermediate scale of 18 hectares. •A single cosmic ray probe can replace a network of conventional in-situ instruments to provide reliable soil moisture estimates. •The cosmic ray probe is capable of estimating soil moisture in previously problematic areas (saline soil, wetlands, rocky soil). •Cosmic ray probes can provide data for hydro-meteorologists interested in land-atmosphere interactions. •The cosmic ray probe estimates can be promising for remote sensing scientists for product calibration and validation. There has been a continual need to monitor and measure the various parameters in land surface hydrology, in order to deepen the understanding of hydrological processes, their importance in the hydrological cycle and their interactions between each other.1,2 Soil moisture is an important parameter in the hydrological cycle and impacts a variety of applications, including agricultural management, climate and weather applications, flood and drought forecasting and groundwater recharge. In-situ measurements of soil moisture are the conventional methods used by several disciplines. The point measurements obtained cannot adequately represent the spatial characteristics of soil moisture and thus limit our understanding of feedbacks to the atmosphere. However, these point measurements play a key role in a variety of large-scale applications and are invaluable as both calibration and validation data.6 Recently, the cosmic ray probe (CRP) method, which is an innovative in-situ instrument, has been developed and implemented in numerous countries across the globe.7 Countries such as the USA, Australia, Germany and the United Kingdom have invested greatly in this technology and have created national soil moisture monitoring networks. 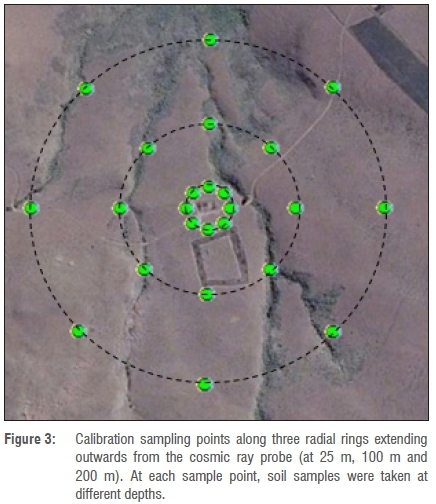 The CRP technique obtains the area-averaged soil moisture, at an intermediate scale, by observing and measuring the cosmic ray neutrons above the soil surface.8,9 The CRP has not been evaluated in South Africa, thus the aim of this study was to test and evaluate the suitability of the CRP to provide spatial estimates of soil moisture, using the Cathedral Peak Catchment VI as a study area. The Cathedral Peak area is important as it is the 'water towers' of the region, as much of our water is generated in this area. The CRP was set up in Catchment VI, as it is already heavily instrumented, and an added soil moisture instrument would add value to any potential research done in the area. In-situ soil moisture measurements have played a key role for a variety of large-scale applications and have been invaluable as calibration and validation data for satellite-based products, sensors and models.6 These include the gravimetric, neutron scattering and time-domain reflectance (TDR) methods.12 The major limitation of all conventional in-situ methods is that they provide point measurements, which do not account for the spatial characteristics of soil moisture.13 No single point measurement can be entirely representative of larger areas, because of the heterogeneity that exists in soil properties, topography, land cover and meteorological conditions.6 To overcome this limitation, dense soil moisture networks can be set up. However, the high costs of operation and maintenance make the set-up of the network financially unfeasible,6 particularly for the objective of establishing a national scale network. The CRP is the only in-situ technique that can obtain the average soil moisture content over hundreds of square metres - something that would require a dense in-situ point measurement network.9,14 The CRP estimates soil moisture hourly at a shallow measurement depth that ranges between 0.12 m and 0.72 m. The CRP system consists of neutron counters (moderated and bare tubes); a data logger which measures barometric pressure, humidity and temperature; a telemetry system with antenna to connect to an iridium satellite; and a battery and solar panel for powering the system. 1.The scattering probability or the elemental scattering cross-section. 2.The logarithmic decrement of energy per collision. 3.The number of atoms of an element per unit mass of material, which is proportional to the concentration of the element and to the inverse of its mass number. The CRP system consists of two sensors, which are the moderated and bare sensor. The moderated sensor is shielded by a 25.4-mm-thick polyethylene and measures the fast neutron intensity above the soil surface. The fast neutron intensity above the soil surface is inversely proportional to the soil moisture content.7 The bare tube (unshielded) measures the thermal neutrons, which are attributed to the water above the soil surface (biomass and snow). The effective measurement depth is the thickness at which 86% of counted neutrons arise, which depends strongly on the soil moisture content.14 The measurement depth ranges from 0.12 m to 0.7 m and is inversely proportional to the soil moisture content.9 The decrease in the measurement depth as a result of an increase in soil moisture is nonlinear. For absolute volumetric water content (VWC), studies have shown that a minimum of three calibrations should be conducted to obtain soil moisture estimates with an error less than 2-3%VWC. The CRP can provide useful data even if the calibration is not conducted. For use in flood forecasting or land surface model data assimilation, the relative changes (patterns) can be used from the corrected neutron counts directly. 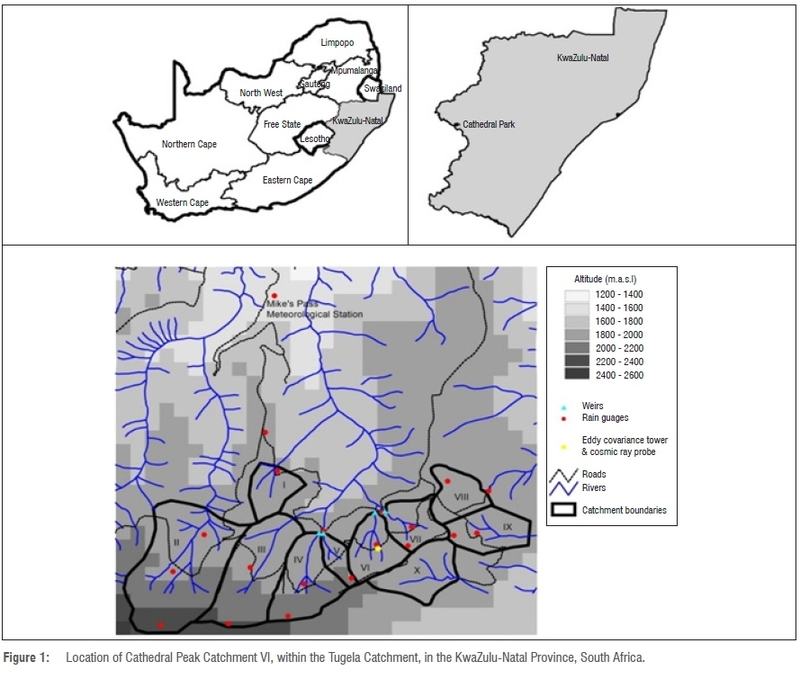 The CRP was installed on 28 February 2014 in the Cathedral Peak Catchment VI (Figure 2). The calibration procedure involves obtaining an estimate of the area-averaged soil moisture content over the CRP measurement footprint by gravimetric sampling and the subsequent neutron intensity. Soil samples were taken at three radial rings, extending outwards from the CRP. The radial rings were situated at distances of 25 m, 100 m and 200 m from the CRP (Figure 3). At each of the three rings, eight points were taken at an equal distance along the circumference of the ring. At each sample point, soil samples were taken at different depths. Four calibrations were carried out over a period of 8 months. The calibration dates were 9 July 2014 (winter), 28 August 2014 (spring), 2 December 2014 (summer) and 22 January 2015 (late summer). The gravimetric method was used to obtain soil samples within the CRP footprint, to determine the area-average soil moisture for the calibration of the CRP. The gravimetric soil moisture content is expressed, by weight, as the ratio of the mass of water present to the dry weight of the soil sample (g/g). The CRP, however, measures the volumetric soil moisture content, which is expressed as the ratio of volume of water to the total volume of the soil sample (cm3/cm3). The calibration of the CRP requires a representative bulk density value to convert the gravimetric soil moisture content to volumetric water content. The bulk density determination was carried out by obtaining undisturbed soil cores at various locations and depths within the catchment. The average measured bulk density was 0.593 g/cm3. This low bulk density value can be attributed to the soil cover, organic matter content, soil structure, porosity and the lack of compaction, as the catchment is situated in an undisturbed area. where Pvo is the absolute humidity of the air (g/m3) and Pvoref is the reference absolute humidity of the air (g/m3). where Im is the selected neutron monitoring count rate at any particular point in time and Iref is the reference count rate for the same neutron monitor from an arbitrary fixed point in time. The neutron flux data was obtained through the neutron monitoring database (www.nmdb.eu), which provides real-time data from a global network of monitoring stations. where x, y, z is location and elevation, and t is time. where θp is the gravimetric water content (g/g), θLW is lattice water content (g/g), θsoc is soil organic carbon water content (g/g), Pbd is dry soil bulk density (g/cm3), N is the corrected neutron counts per hour, and N0 is an instrument-specific calibrated parameter. We note that soil moisture is often expressed in units of volume per cent (VWC(%) = θp × Pbd × 100). θsoc was not determined, but was given a value of 0.01 g/g based on published values.8 θlw was determined to be 0.154 g/g. A 50-g representative soil sample was sent to Activation Laboratories in Canada for θw determination by combustion at 1000 °C. where BWE is the biomass water equivalent (mm). The biomass calculation is done for vegetation types whose biomass changes with their growing stage. Because the vegetation of Catchment VI is short grassland, the biomass was small29 and the change in biomass in this context was therefore insignificant and a biomass correction was not required. The neutron count (N) for each calibration was determined as the average neutron count during which the soil samples for that calibration were obtained. These counts were used to determine the N0 value for each calibration, using the rearranged calibration Equation 7 (Table 1). The average No value for the calibrations was calculated to be 3249.324. This calculated No value was used in the rearranged calibration function equation (Equation 8) to determine the hourly VWC (Figure 4). The hourly CRP data (grey line) were converted into daily (black line) average to smooth the data and for comparison with other daily-derived soil moisture products. The results show that soil moisture was higher in the summer and lower in the winter (Figure 4), as expected in the summer rainfall region of South Africa. The effective measurement depth of the CRP over the 1-year period between March 2014 and March 2015 (Figure 5), showed that the effective measurement depth ranged from 0.084 m to 0.148 m, with an average effective measurement depth of 0.117 m.
It was essential to create an in-situ soil moisture network within the CRP measurement area, to obtain data that could be used to validate the calibrated CRP estimates. The in-situ soil moisture network consisted of three types of measurement instruments, which were installed on 9 July 2014: one soil pit with TDR probes inserted horizontally at depths of 0.05, 0.10, 0.15, 0.20 and 0.30 m; five wireless TDR sensors (0.12 m) inserted vertically into the soil surface; and eight Echo probes inserted horizontally at a depth of 0.10 m. The five wireless TDR probes and eight Echo probes were placed within the CRP's footprint area. All three sets of data were merged by weighting each point within the catchment equally, to create a representative in-situ soil moisture estimate. For consistency, only the 0.10 m and 0.15 m TDR pit data were used, which coincide with the two other in-situ measurement method depths and the effective measurement depth of the CRP. The CRP has a varying effective depth, which could be validated against the TDR pit, which has sensors at different depths; however, the aim was to test the suitability of the CRP to provide spatial estimates of soil moisture, which required a spatial validation data set and not a single point measurement. Soil moisture varies both spatially and temporally and fluxes in soil moisture content occur over short time periods and distances. The key input to the soil moisture content in Cathedral Peak Catchment VI is rainfall. Therefore, rainfall data are necessary to support and explain changes in soil moisture. Rainfall data from a rain gauge situated within Catchment VI were obtained for the 1-year period from March 2014 to March 2015 (Figure 5). The rainfall distribution showed that most of the rainfall (73%) occurred in the summer months. 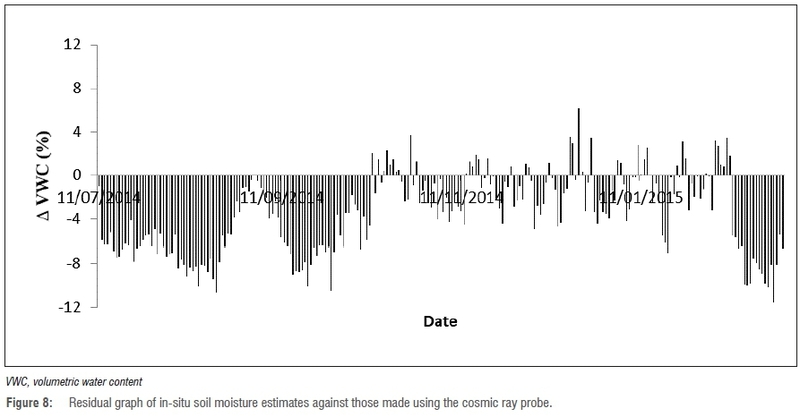 A time series of the CRP and in-situ soil moisture data (Figure 6) showed the dependency of the soil moisture fluctuations on rainfall. There were smaller fluctuations in winter as a result of lower rainfall than in summer, during which the fluctuations in soil moisture were greater, because of more rainfall events. The CRP estimates correlated better in the wetter periods (slope=0.976) when the soil moisture values were above 30%, compared to the drier periods (slope=0.691). 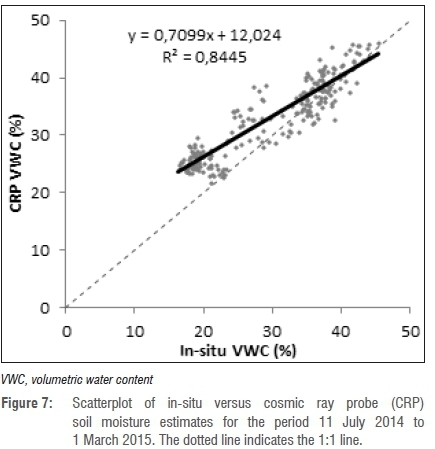 The CRP estimated soil moisture on average 3.45 VWC (%) higher throughout the validation period, when compared to the in-situ data set. This result is ascribed to differences in the measurement depths between the CRP and the in-situ instruments. Overall, the CRP-derived soil moisture followed the general trend of the in-situ soil moisture variations. A graph of in-situ (x-axis) versus the CRP (y-axis) soil moisture estimates revealed that the majority of the points were above the 1:1 line (dotted) (Figure 7). There were no extreme outliers. The positive y-intercept of 12.024 indicated an over-estimation by the CRP of the lower values (when the soil was drier). There was a good agreement between both data sets, shown by the high R2 (0.845). A graph of the residuals (differences between the in-situ and CRP data sets) against time was plotted (Figure 8). The ∆VWC (%) was the difference between the in-situ (independent) and CRP (dependent) data sets. This graph is plotted to illustrate how the difference in variables change over time. Most of the residuals are negative, which indicates that the CRP over-estimates soil moisture when compared to the in-situ data set. In the drier periods, the residuals range from -0.52 to -11.54 VWC (%) (with an average of -6.25 VWC (%)), which indicates that the CRP over-estimates soil moisture throughout these periods. In the wet periods, the residuals vary from 6.16 to -7.08 VWC (%) (with an average of -0.90 VWC (%)). The CRP performed better in the wetter periods, when compared to the in-situ measurements, as the average absolute residual value is less than that of the corresponding drier periods. A paired t-test (Table 2) revealed that the mean of the CRP was 3.5% higher than the in-situ data (negative t-statistic). The variance for the in-situ soil moisture was higher than the CRP by 30 and suggests the higher variation of point measurements when compared to the large area average of the CRP. The absolute value of the t-statistic (4.827) was greater than the critical two-tail value (1.965) and the p-value (1.919x10-6) was less than the alpha value (0.05) showing that there was a significant difference between the methods. 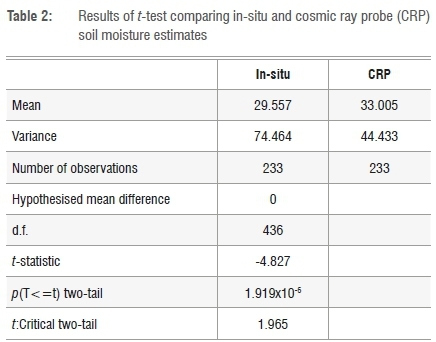 The differences between the in-situ and the CRP soil moisture estimates can be explained by the following. The in-situ data set was not the actual average of the catchment, but the average of the sensors in the catchment. If the sensors were placed in different locations in the catchment, the in-situ data set could be different. The area covered by the in-situ sensors was smaller than that covered by the CRP. The in-situ soil moisture sensors were a maximum of 200 m away from the CRP; however, the CRP has a measurement footprint that exceeds 200 m in radius. The CRP was not measuring soil moisture at a constant depth throughout the validation period, as its measurement depth depends on the soil moisture content. When the soil was dry, the CRP probe was measuring at a deeper depth (0.14 m) than when the soil was wet 0.10 m). The representative in-situ data set was measuring constantly at an average depth of 0.12 m. Therefore, the dry periods did not correlate as well as the wet periods, as the measurement depths were different. Understanding the spatial and temporal variability of soil moisture at different scales is of great importance in many land surface disciplines, such as hydrology. Soil moisture is a key hydrological variable, as it impacts the water and energy balance at the land surface-atmosphere interface and is the main water source for natural vegetation and agriculture. It is difficult to quantify and assess the soil moisture content at an intermediate scale, because of the heterogeneity in soil and land-cover properties, climate drivers and topography. The validation of the CRP with a representative catchment soil moisture data set, from the in-situ soil moisture network, showed that the CRP is suitable for providing continuous spatial soil moisture estimates. The following recommendations can be used to address the main limitations that were experienced in this research study. These recommendations will provide assistance for future research studies. The calibration of the CRP is time and labour intensive, as numerous gravimetric soil samples within the measurement footprint at several depths are required. The use of a TDR Hydro-Sense probe, which obtains instantaneous measurements of volumetric soil moisture when inserted into the soil, can potentially be used to obtain the necessary soil moisture measurements for the calibration. Thus, it would greatly reduce the time and labour required, as well as eliminate the need to determine the bulk density which is needed to convert gravimetric soil moisture to volumetric soil moisture. The validation of the CRP should ideally be done with in-situ soil moisture sensors at a variety of depths. Ideally, several TDR pits in the CRP measurement volume could be used. This approach would improve the validation, as the CRP does not measure at a constant depth. However, this approach would be very capital, time and labour intensive, as a dense network of TDR pits would be required. The number of calibrations carried out against the accuracy of the calibrated CRP estimates needs to be considered. In theory, more calibrations carried out would result in more reliable estimates of soil moisture. In practice, each calibration requires time, labour and capital to conduct. Therefore, although we conducted four calibrations, reliable estimates could have been obtained with two calibrations, one each in opposing seasons. T.V. : Setting up and calibrating the cosmic ray probe, writing the manuscript, editing the manuscript. C.E. : Supervision, setting up the cosmic ray probe, planning the logistics of the fieldwork, editing the manuscript. M.M. : Supervision, setting up the cosmic ray probe, calibrating procedures, editing the manuscript. T.F. : Cosmic ray probe teaching, calibration training, editing the manuscript.